In recent HelpSmith releases we implemented a built-in web server for testing a compiled Web Help system on the local computer. A full-featured HTTP server makes it possible for you to avoid limitations that modern browsers apply to local HTML pages, so you can now fully test your Web Help system before you upload it to a real web server. 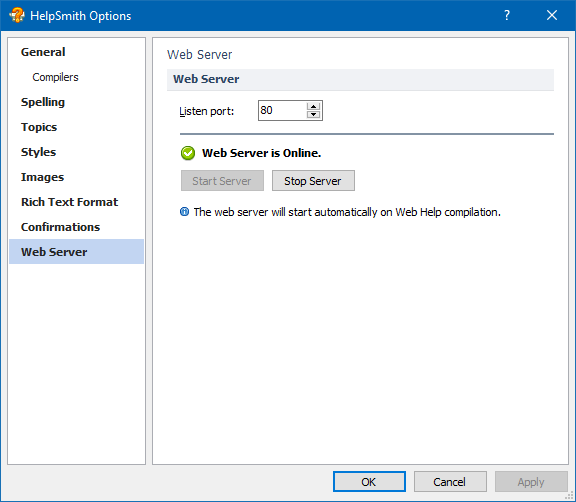 How to Use HelpSmith’s Web Server? Thus, the HelpSmith’s HTTP server runs automatically and works in the background allowing you to continue editing your documentation or even switch to testing another Web Help system at the same time! It should be pointed out that while the web server allows you to access HTML files by their location on your PC, the server is completely secure since it does not allow connections to it from a remote computer. While the HelpSmith’s HTTP server is fully automatic, you may need to control and modify its settings in some cases. To access the web server-related settings: On the File tab, in the left sidebar, click Options. Here you can define the port number used by the web server manually. Please note that if the specified port is busy with another service or application, HelpSmith will try to find and use another port. Finally, you can start or stop the server manually by clicking the appropriate buttons. However, please note that the web server will run automatically when you compile your Web Help system.